Sonia Flew flies to Cuba! 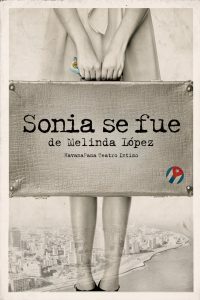 In 2017 Wellesley Rep produced SONIA FLEW, bringing back to Boston the acclaimed play by Wellesley College faculty member Melinda Lopez after its lauded introduction in 2004. We are thrilled to announce that Melinda is about to experience a life-changing event: two of Melinda’s plays (BECOMING CUBA and SONIA FLEW) are being published in Cuba in October. Melinda’s storied return to Cuba several years back was of course relayed to the world by President Obama in 2016. We in the Wellesley Rep and Wellesley College Theatre family are all thrilled for her, and so happy to share her deserved accolades and imminent experience, building bridges between countries through her art.